Africa is home to some of the world’s fastest growing economies. The population of the middle class is growing exponentially, leading to increased purchasing power in many households resulting in several multinational organizations establishing themselves on the continent. All these developments have created a growing demand for actionable, credible and contextual consumer data which is often challenging to obtain making it difficult for businesses to expand. Kenfield Griffith, mSurvey’s co-founder and CEO created mSurvey as a result of his own encounter with several stumbling blocks as he searched for data in emerging markets while studying for his PhD in MIT. It was at this point that he developed his passion for simplifying access to quality consumer data from communities that were initially hard to reach. He went on to find a solution with co-founder and CTO Louis Majanja and launched mSurvey in Nairobi. mSurvey’s vision then grew to promoting growth and development in businesses in Africa through actionable feedback. mSurvey leveraged on the high mobile penetration rates in Africa to create a feedback loop with businesses and their customers in real time. mSurvey’s partnership with Safaricom, East Africa’s largest telco and the pioneers of mobile money in Africa, has also contributed greatly tomSurvey’s success over the years from receiving Safaricom’s Spark Fund investment to partnering in products such as Consumer Wallet which was launched in early 2017.
mSurvey has observed numerous successes in Kenya. Java House Africa, Kenya’s largest gourmet café has worked with mSurvey to get direct interaction from their customers helping them advance their core value of African hospitality as their CEO Ken Kuguru elaborates in this video. Retailers such as Chloride Exide, East Africa’s largest suppliers of batteries have also experienced growth in sales and revenue as a result of using mSurvey. 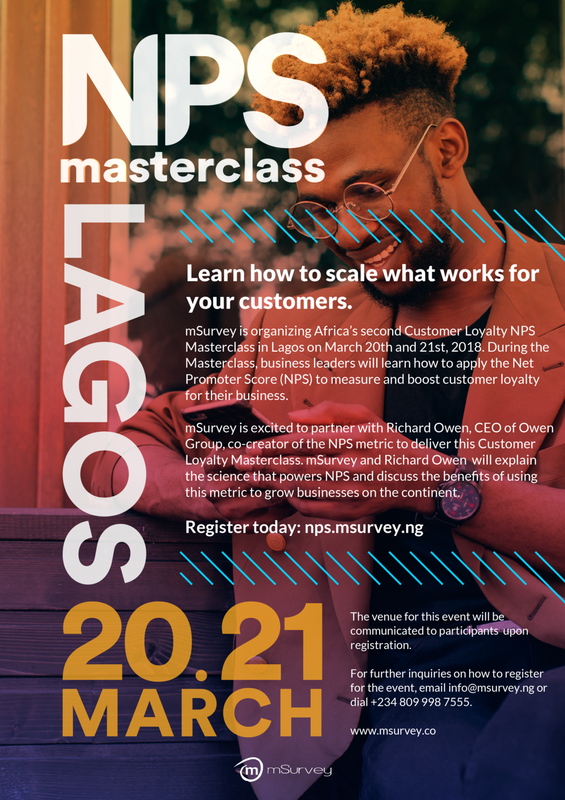 To that end, mSurvey has partnered with Richard Owen , co-creator of NPS and CEO of Owen CX Group to host Africa’s second Customer Loyalty NPS Masterclass in Lagos on 20th-21st March 2018 to give Nigerian operational and management teams a better understanding of NPS and how leading brands across the world are improving their customer experience to drive growth as well as how to apply NPS methodology in the Nigerian context. Our previous Customer Loyalty NPS Masterclass hosted in in Nairobi, December 2017, was kicked off by Kenya’s Cabinet Secretary for Tourism,Hon. Najib Balala, EGH, and was followed by a panel discussion on the future of customer service and customer experience in Africa. We were joined by key executives from various sectors including retail, telcos, hospitality, financial institutions with attendance from some of Kenya’s top brands such as Safaricom, Java, KCB, Airtel and CBA just to name a few. Businesses in Africa need to get customer experience right and working with mSurvey makes it easier for businesses to deal with rising customer expectations and retain their customers. 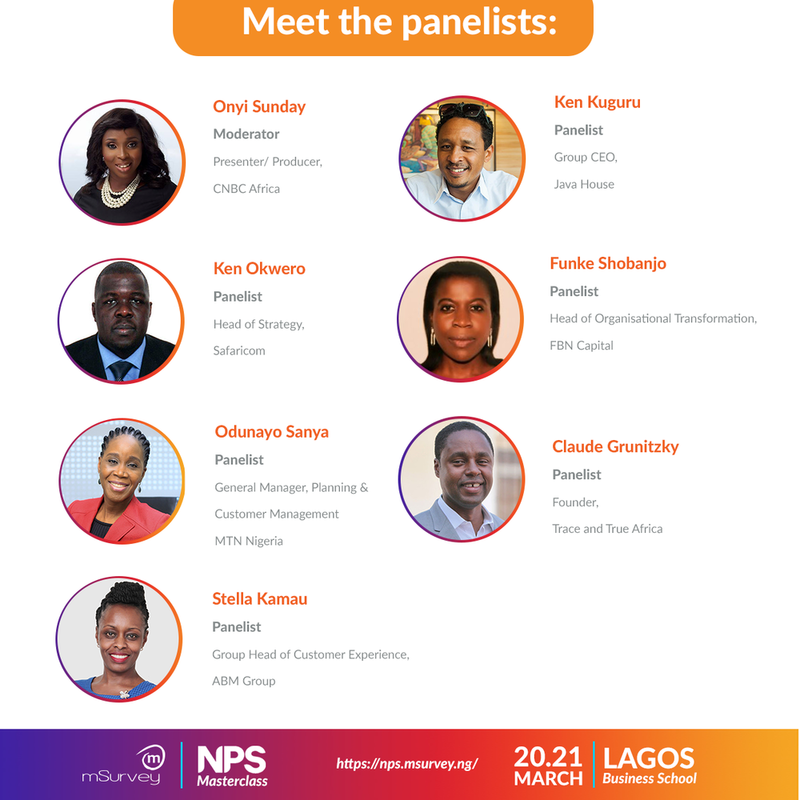 Click the button below to register for mSurvey’s Customer Loyalty NPS Masterclass in Nigeria.